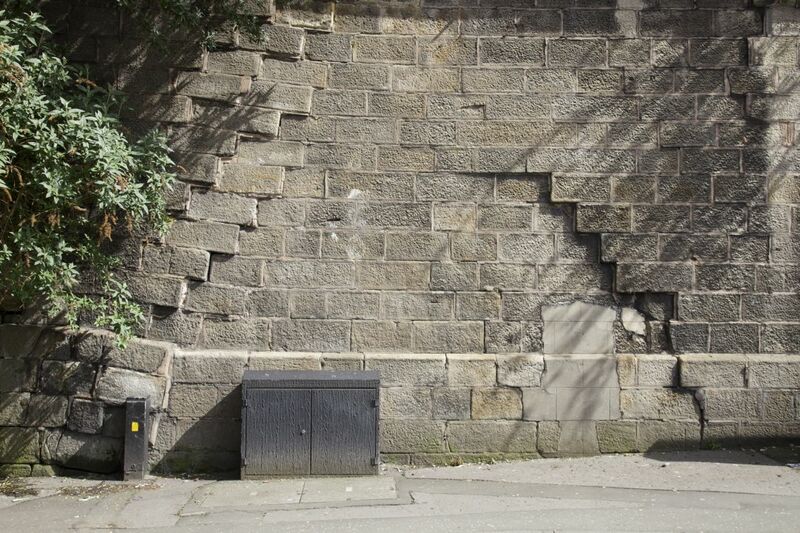 At the corner of Hunt’s Bank and Victoria Street near Victoria Station in Manchester is a stone wall (2) that betrays the otherwise invisible presence of one of the city’s principal rivers – the Irk. For here, the obvious visual signs of subsidence – sunken blocks of stone – were brought into being by what lies beneath the ground: namely, a massive culverted section of the river Irk than runs nearly a kilometre from the railway viaduct that emerges northwards from Victoria Station to the point where the Irk empties itself into the Irwell, just a few yards east of this sunken wall. This peculiar half-ruined wall makes visible a presence of absence, an immediate visual reminder of something hidden; perhaps even, like most ruins, a gentle admonition to those who would forget what has been lost. Yet, this ruin also tells us, uncontrovertibly, that the river is not lost; indeed, in its very ruin, it betrays the river’s continuing presence and influence on the city. Like many urban river culverts, that of the Irk is deliberately hostile to would-be explorers. It’s entrance – seen from the steps that descend into Manchester’s new Green Quarter from Cheetham Hill Road – is a forbidding black hole into which rushes the fast-flowing river over a 2-metre high weir (3). 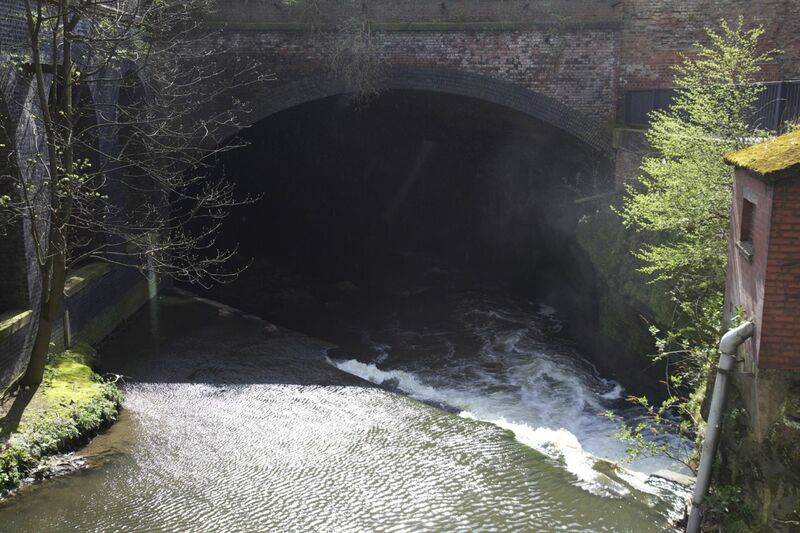 As documented by Manchester’s urban explorer community, getting into that black hole is difficult even at the driest of times: it involves wading in chest-high murky water before descending the slippery weir into complete darkness. Flanking the river before it disappears are the shiny new skyscrapers of the Green Quarter – a characteristic (if extreme) juxtaposition of high technology and ‘low’ nature in the post-industrial city. 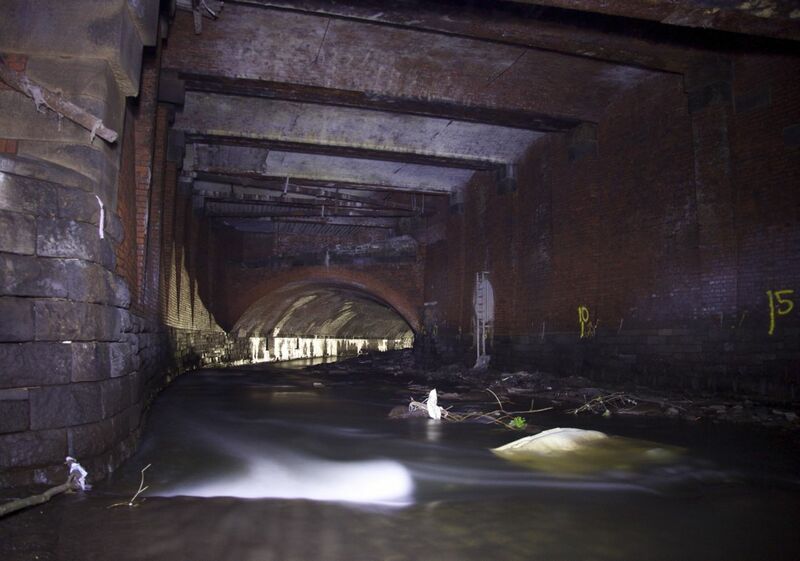 The now hidden section of the river Irk was culverted in several stages from the late-1840s to the 1910s (4 & 5). 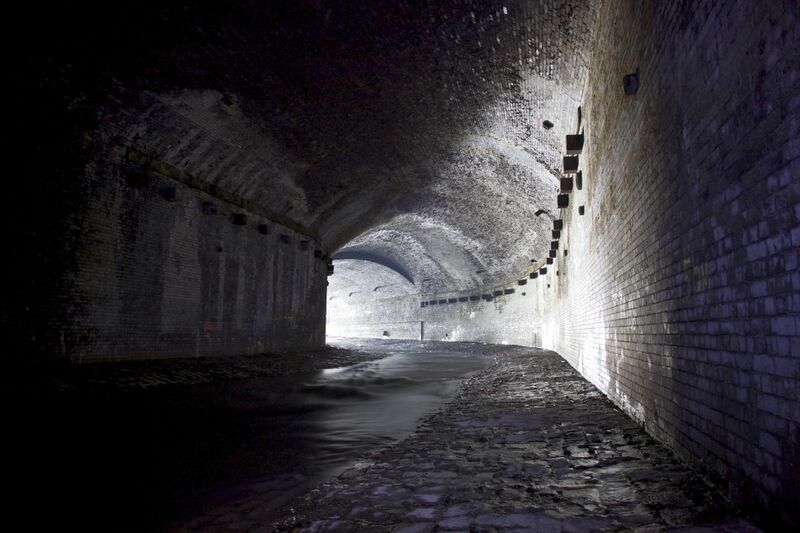 As famously described by Frederich Engels in 1844, the Irk was once one of the foulest watercourses in Manchester, a river that was polluted with the wastes of the tanneries, bone mills, gasworks and the privies of innumerable half-ruined medieval houses that originally lined its banks where the culvert now runs. In 1844, standing on Ducie Bridge, Engels described the open river as a ‘coal-black, foul-smelling stream’ that was filled with horrible slime and refuse and whose waters produced bubbles of ‘miasmatic’ gas that ‘gave forth a stench unendurable’ even high up on the bridge. As documented in successive maps of this part of Manchester (4 & 5), this noxious waterway was unsurprisingly removed from sight (and smell): firstly, in 1849, when the section flanking Chetham’s School was bricked over and then, around 1902, when a longer section was culverted after Victoria Station was extended southwards. 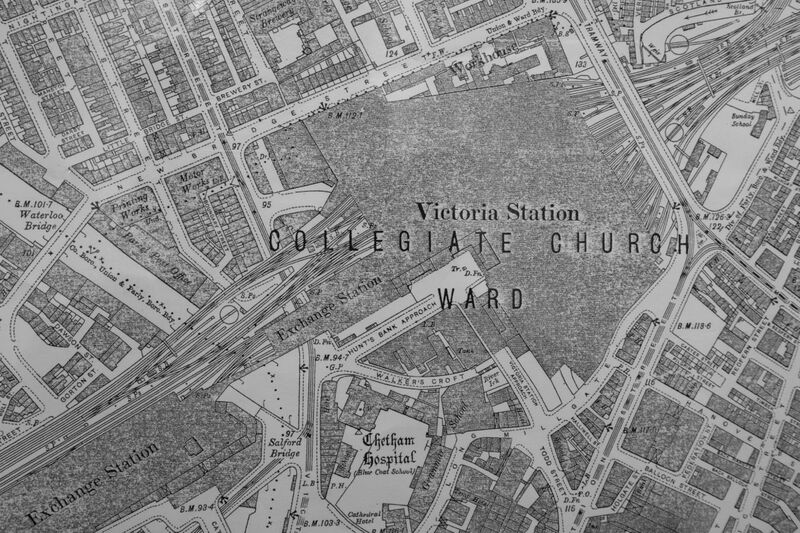 The small remaining section of open river – to the east of what is now Victoria Station Approach was built over sometime in the early 20th century, only reappearing ‘symbolically’ in a recreation of part of the river in a fountain sculpture in what is now Cathedral Gardens, redeveloped after the IRA bomb in 1996. What of the space of the culvert itself – the source of that invisible presence which continues to make itself felt in the city above? 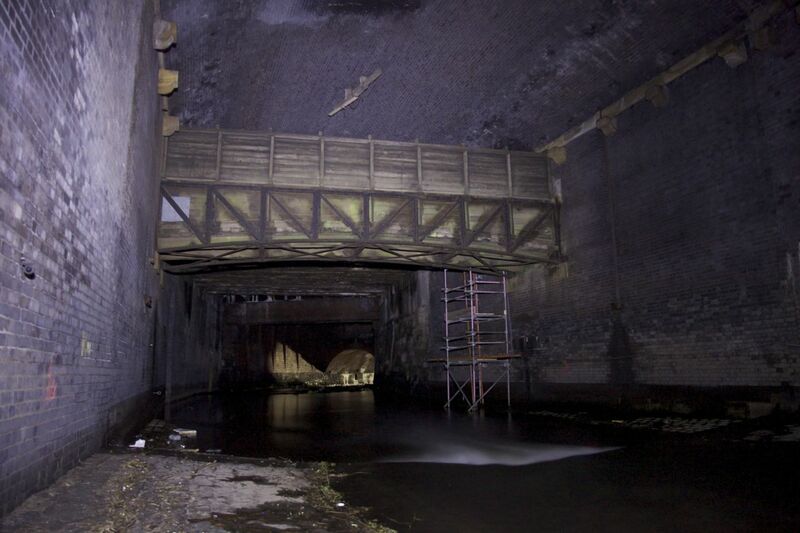 Once inside the culvert, the space seems to grow – the 20-foot span arch seen at the entrance now supported on immense high brick walls; while the noise of the rushing water is magnified by the cavernous space (6). The sights and sounds recorded by Engels may have (thankfully) disappeared, but the river still has a fearsome quality to it: a smell that makes one light-headed (dangerous, as all urban explorers know); a furious velocity; and, as if testifying to the latter, a channel lined with tree branches, shopping trolleys, car tyres and other forms of urban detritus. Such accumulated ruin is counterbalanced by what has been preserved – a bricked-up arched space in one of the walls that was once used as a shute for depositing dead cattle onto boats (7) and, perhaps most extraordinary of all, a wooden bridge suspended between the walls of the culvert (8). 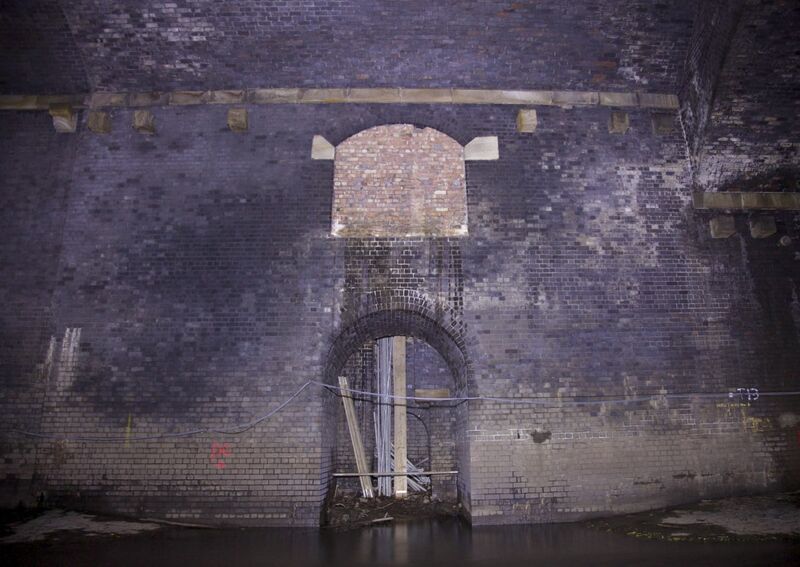 This bridge – now bricked up and used as a utility tunnel – used to carry cattle from the fields on the north side of the Irk to the markets in Shudehill and it probably dates, at least in part, to around 1650, when Manchester was little more than a village. For this bridge to have survived so long after its pre-industrial function had been extinguished is testament to its power as a petrified ruin. It is paradoxically the ruin of the river (and its subsequent banishment) that has preserved this ancient relic intact; out of sight (and mind) it has been allowed to escape the relentless modernisation that has characterised Manchester from the eighteenth century onwards. If urban modernity requires the city to develop by a process of ‘creative destruction’ – or deliberate ruination/rebuilding – then this preserved ruin directly challenges that process. Its continuing existence speaks of the residues of modernity, or the ruins that do not yield to modernity because they continue to serve it in some unforseen way. It’s as if, from that bridge, the rushing river below described by Engels somehow refuses to be expunged from Manchester’s urban memory. Perhaps the name given to this culvert by urban explorers – Optimus Prime – is more than a rather infantile pseudonym; for has the culvert truly not transformed the river into something mythic? Thank you for all of your blog posts. This one I find particularly haunting, especially the traces of the movement of animals (dead and alive) in and around Manchester. Thanks Susan. Glad you enjoyed this post. Disturbing stuff here. However I am ‘enjoying’ this series(?) on underground Manchester. Thank Diana…I think the series ends here! Fascinating asnd especially about the cattle bridge. Thanks – yes the cattle bridge is a marvel and possibly one of the oldest wooden structures in Manchester. Really enjoyed this, thank you. ‘Miasmatic’ is a word that should be used more often. I’d say the original wooden bridge has been taken down and rebuilt post mid 1800’s. If you look at this https://imgur.com/a/71JODuB you will see the stringers (6×6 timbers) are slotted into the floor beams (steel RSJ’s), in 4 sections. I don’t think manufactured steel like this was around in 1650. The steel frame construction seems based on the classic Pratt Truss Bridge design, which was introduced in 1844 according to historyofbridges.com. So I think it is very unlikely that it dates back past 1844. Thanks Josh. Yes, you are quite right – it’s a modern replacement for an older structure. 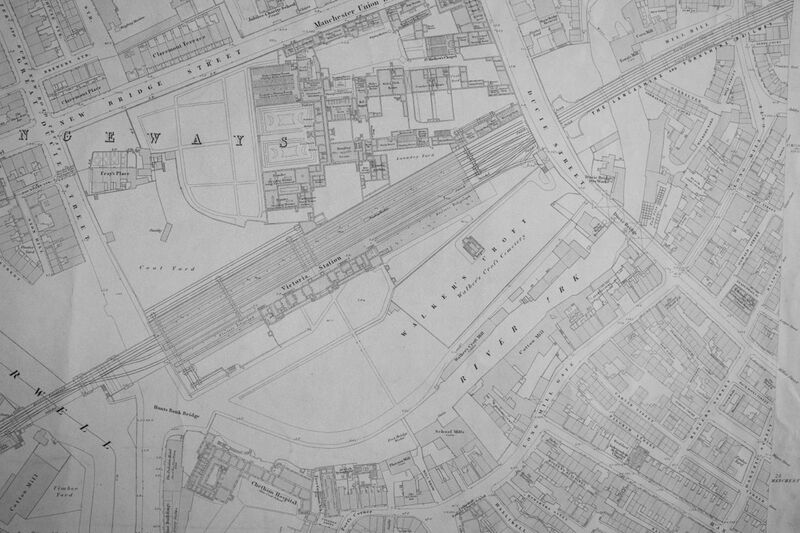 And 1844 makes sense as part of the river was culverted around then. Thanks for correcting me on this!